The assessment last week by the European Environment Agency that Ireland is set to fail to achieve its binding 2020 greenhouse gas emission reduction target comes as no surprise. At 20% below 2005 emission levels, the Irish target is the highest possible in the EU. This in itself is another fateful legacy of ‘Celtic Tiger’, as national targets were assigned based on relative wealth (GDP per capita). As we now know, Ireland’s wealth in the mid-2000s was largely illusory. The consequences now put the government in an unenviable bind of having to make the deepest cuts in emissions while also grappling with the aftermath of one of the deepest European recessions. The line coming from Minister Alan Kelly is that the 2020 target is simply “unrealistic and unachievable”. Of course, in the continuous absence of any meaningful strategic efforts to reduce emissions, epitomised by the complete failure to enact a climate change law, it will continue to remain so. Despite the progressive rhetoric on climate change, to date there has been but paltry implementation of actual measures, with the bulk of any emission reductions largely coming as an unintended consequence of the recession. Inaction on climate policy has been driven by the classic Irish persuasion of brushing inconvenient issues under the carpet, particularly when there are no immediate consequences for doing nothing. Unfortunately, this short-sightedness has only served to dig a deeper hole from which we must now get out of. For under EU law, further procrastination is no longer an option. From now, and each year to 2020, Ireland is under a direct and binding legal obligation to reduce its emissions in a linear fashion. This will not be achieved, and is likely to force the government to avail of flexibility mechanisms and to purchase compliance, such as buying expensive carbon credits. Furthermore, in accordance with the new EU Semester budgetary surveillance process, Ireland is required to achieve its national Europe 2020 targets, which also includes the 20% reduction in greenhouse emissions. The European Commission can issue annual Country Specific Recommendations (CSRs) and these could compel Ireland to introduce specific policy measures and, if necessary, impose financial sanctions. This may include, for example, environmental tax reforms, such as a significant increase in carbon taxes or other user charges (as was included in the 2014 CSRs for Luxembourg, for example). Similar to the current furore over water charges, such fiscal measures would obviously be extremely unpopular. So what is the scope for reducing emissions in the Ireland? Agriculture and transport together make up approximately 70% of all emissions for the purposes of the 2020 target. As part of its economic recovery plans, the government has been categorical in its position that emissions from agriculture will rise under the massive Food Harvest 2020 expansion plans. In fact, Ireland has been very active in arguing for special greenhouse gas accounting rules for agriculture. However, such rules, if they prove their worth, could not be introduced until at least 2022. As a result, in the short-term a disproportionate burden will have to be placed on the transport sector. A further unfortunate legacy of the ‘Celtic Tiger’ is that from 1990 to 2012 transport was the fastest growing source of emissions, increasing by 113%, mostly due to a threefold increase in the use of private cars. In 2009, the ‘Smarter Travel‘ policy was introduced and proposed that by 2020 car commuting to work should drop from 65% to 45%; alternatives such as walking, cycling and public transport should rise to 55% of total commuter journeys; and that future population and employment growth would predominantly take place in sustainable compact forms, which reduce the need to travel. This policy was a key component of the measures proposed to reduce Ireland’s transport emissions for the purposes of the 2020 target. However, in the most recent draft ‘Investing in Our Transport Future’ policy document published by the Department of Transport in August, reality has bitten and these ambitious targets have now been abandoned. The report concedes that despite successive national policies which have had the consistent stated objective of promoting modal shift away from private cars and better integrating land-use and transportation, it must now be recognised that these policies have failed. As a result, given the diverse range and dispersed pattern of journey origins and destinations, there is now extremely limited potential for reducing emissions in the transport sector and “current spatial patterns remain very unfavourable to efficient and sustainable transport provision”. According to the report, even achieving widespread modal shift in our cities would yield little emission savings due to the short nature of such trips and the sheer scale of spatial sprawl and bloated commuter belts which have embedded car dependency. The report goes on to conclude that “reducing emissions from transport would require a transformation in the sector, relying on technological innovation and security of alternative fuels supply supported by enabling policies and widespread behavioural change”. What this in effect means is the extensive roll-out of electric vehicles. The government has a target of achieving 10%, or approximately 250,000 electric vehicles by 2020. There are currently around 250 in use. Worldwide there are only around 400,000. The stored up costs of past planning failures just keep on giving and latest draft transport policy document reads as a pretty damning indictment of the spatial chaos that was allowed to take hold during the ‘Celtic Tiger’ and the complete failure of the national policy to curb sprawl. Aside from the climate policy implications, as a consequence of the new budgetary realities, major questions are posed in the report as to whether Ireland can now afford to respond to these spatial patterns in terms of investment requirements and service provision costs. We are already seeing the implications of this with the recent decision by the National Transport Authority to approve a further increase in public transport fares. Options being actively considered include reducing the size and/or level of performance of the funded road and rail network to a more appropriate scale (particularly rail due to its high fixed costs vis-à-vis passenger numbers) together with demand management through fiscal measures, such as road user charging based on distance and time. Clearly, the scope for such additional charges, infrastructure downgrades or service withdrawals is limited by realpolitik, the existing burden of taxation, the hardship being experienced by many families and high levels of household expenditure on transport, where people have no or inadequate access to more sustainable transport modes. Until now the debate on Ireland’s greenhouse gas reduction targets has largely taken place in the abstract. However, the latest IPCC report this week has further firmed up the scientific evidence and the scale of mitigation required, and this issue is not going to go away. Likewise, the EU has recently agreed a post-2020 framework to reduce emissions by 40% by 2030, with national efforts again distributed on the basis of GDP per capita. Despite the recession, Ireland still has the fifth highest GDP per capita in Europe, guaranteeing a relatively high emission reduction target. In the coming years the unreality will have to end and the choices necessary to reduce emissions will come into sharp relief. None of them will be easy, inexpensive or without controversy. According to a briefing this year by the Department of Public Expenditure and Reform, in the absence of national mitigation, potential costs of purchasing compliance for the Irish Exchequer for the 2020 to 2030 period could have a cumulative total in the billions and there is cause for concern. Unfortunately, the fixed spatial legacy handed down by past planning failures has locked-in high fossil fuel use and entrenched car dependency which severely limits the choices now available and significantly increases the costs of mitigation options. In climate change policy jargon the ‘least cost principle’ would dictate that spatial planning practice and transport investment should be better and more firmly aligned. However, this lesson continues not to be learned – currently almost 50% of all new houses granted permission are for dispersed car dependent ‘one-off’ dwellings. It will be these same households that will bear the brunt of future transport cost inflation, downgrading of infrastructure and service withdrawals. 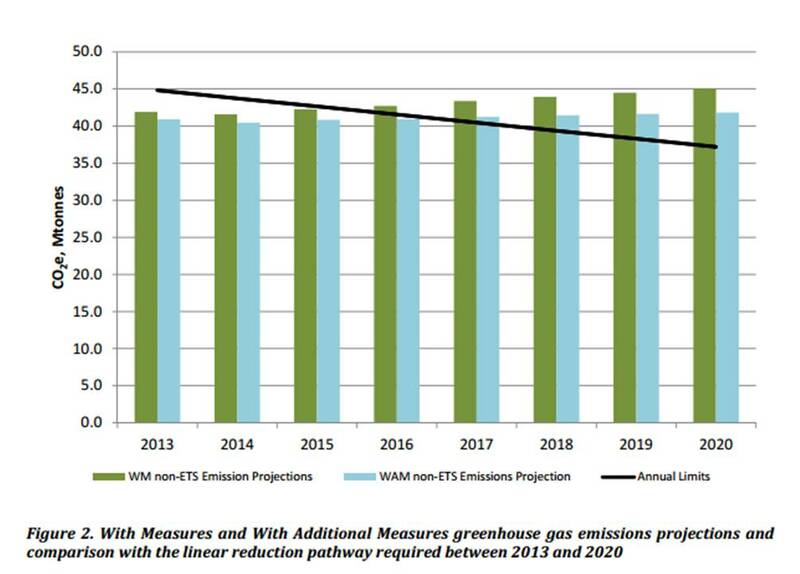 It’s worth noting that the EPA’s projection for Ireland’s transport emissions is for a staggering increase of 66% by 2030 compared to 2012. The Investing in Transport document entirely fails to mention the government’s Climate Action and Low-Carbon Development National Policy Position: an aggregate reduction in carbon dioxide (CO2) emissions of at least 80% (compared to 1990 levels) by 2050 across the electricity generation, built environment and transport sectors. Buried in their silos, government departments continue to act as if they have no clue what others departments or the EU are doing. Whether the ignorance is real or pretended the failure to plan continues to build up ever more cost. The very real failure to limit emissions at all, except by economic meltdown, is Ireland’s very own contribution to global climate damage. Thanks Gavin, Great analysis and links. That’s very interesting about Luxembourg’s CSRs; although Ireland is the second furthest from its 2020 target (after Lux), Ireland’s CSRs don’t refer to climate at all. Because Ireland is emerging from an adjustment programme and a financial crisis, Ireland’s CSRs focus on economic issues. However, in the coming years I suspect you will see additional recommendations on the full range of Ireland’s Europe 2020 targets.